If you’re not quite ready for a huge ranch, but want a little privacy from the neighbors and room for a few horses, the darling one-story home at 9738 County Road 2432 is the perfect transition from city to country. Built in 2005, the extremely well-constructed three-bedroom, two-bath home on three acres features flattering touches such as extra-high ceilings, crown moldings, stained concrete floors, and beautiful automatic gated entry. The floor plan accomplishes being both open and cozy at the same time, with all rooms overlooking the white pipe fenced pasture. The third garage space has been semi-converted to an exercise room, but could be a workshop or even go back to garage use. Small “dog room” offers indoor/outdoor access to your furry family members, and yes, the back yard is safely fenced for dogs, separated from the horse pasture. The back porch area is perfect for grilling out with friends, and enjoying the summer stars you’ll be able to see oh-so-clearly out here. Your horses will feel right at home in the treed pasture, complete with pond and freshly painted white pipe-and-cable fencing. The barn has three beautiful heavy duty steel framed stalls, with water and electric already supplied for ease of care. Located on one of the nicest streets in Poetry, with several $500,000-plus country estates and even an equine veterinary center, this lovely horse property is offered for $339,500 by myself, Ebby Halliday Realtor Kathryn Roan. If you’d like to move to Poetry, we’d love to have you! Typically, Dallasites do not think of Grayson County as a go-to destination for vacation homes. Most of you just thought “Grayson County? Isn’t that near San Antonio?” Not so, friends. Just 66 miles north of Dallas, the county seat of Sherman boasts a population of 39,000-plus and a rich historical heritage. Remember when the signs on Central said “75 North: Sherman” before McKinney got cool? That Sherman. Most areas are heavily treed, with abundant wildlife, sandy loam soil, and a real out-in-the-country feel. The 29.06 acre ranch at 626 Owens Road in Bells, TX is no exception. The private, secluded Austin stone home beyond the lavish entrance is perfect for the weekend getaway. The 5,057-square-foot home features a metal roof for energy efficiency, along with a truly amazing eight car garage and shop for storing all your toys out of the weather while you’re in the city. The main living area is open, warm, and inviting, with extra high ceilings, perfect for summer ranch parties. Take care to invite friends you really like, since they may never want to leave the rustic two-bedroom, two-bath guest house. All this pool needs is you. And a cabana boy with a bottomless supply of mojitos. The nature lovers will appreciate the native hardwoods throughout the property, and the two stunning fishing ponds. Completely fenced with pipe-and-cable fencing and graced with sandy loam soil, this property is perfect for the family who always wanted a few cows or horses. There’s just no better way to spend a spring afternoon in Texas than in the saddle, meandering through the shade of towering oak trees. Sounds like heaven, doesn’t it? If you love to entertain and have been searching for a fabulous family compound away from the hustle and bustle of the city, 626 Owens Road is your dream no frills destination. This spectacular property is offered for $679,000 by Ebby Halliday Realtor Marilyn Sanders. Kathryn Roan is an Ebby Halliday Realtor focusing on farms, ranches, and equestrian properties. Kathryn lives in Poetry with her 7 horses. Contact Kathryn at kathrynroan@ebby.com. The cold weather means we’re watching more TV under piles of blankets, and our flatscreen in the living room has three settings: MLB channel (husband), Nick Jr. (son), and HGTV (me). I had control of the remote last night, and on came Beachfront Bargain Hunt, a relatively new show following much the same premise as House Hunters. The episode that had me hooked was where a family (presumably from the Houston area) wanted to find a Galveston vacation home where they could jaunt off to on weekends and still rent part of the time. They employed Realtor Cheryl Smith to find a beachfront home under $350,000. And guess what, folks? They found a great beachfront home for around $340,000! I had no idea that such amazing deals could be found in Galveston, and not only that, but how gorgeous beachfront properties are. I definitely don’t remember the beach rentals from my childhood looking that great! The best thing about the show, though, was that it took the chill right out of the weather. Just what I needed! And it’s making me want to shop for the perfect summer getaway, too, like, this great beachfront bungalow! Where would you go searching for your beachfront bargain? It’s the most talked about second home resort in the western world, located on a shimmering Bahamian beach dubbed the new French Riviera. 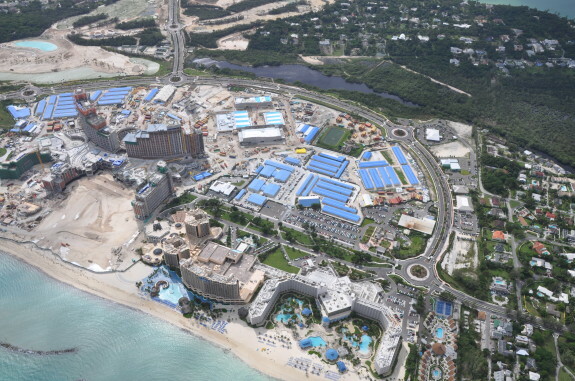 Baha Mar is a $3.5 BILLION mega-resort under construction now in Nassau, The Bahamas. Thousands of construction crews are working around the clock, working so diligently they add one full story to the hotel towers every ten days. It is the largest resort under construction in the Western Hemisphere and has been described as Vegas with 3000 feet of beach. Here’s how majorly buzzed this resort is: I was at a national real estate editor’s conference, talking, actually, to the developer of another major resort in the Caymans. I mentioned that I had visited Baha Mar and was very impressed. Her eyes grew wide. And this came from the competition! Such a development is the colossal Baha Mar mega-resort. The $3.5 billion, yes, with a “B” project is set on 1,000 acres of prime beach front paradise and will soon become one of the world’s largest, most luxurious resorts with everything jet-setting second home owners who love water could desire, and then more. The total square footage of the development is expected to hit 3.3 million, with every square inch devoted to luxury. Baha Mar will open formally in December, 2014. There will be four hotels including a luxury Grand Hyatt, Rosewood, and Mondrian and the Baha Mar Casino & Hotel. All of the hotels will surround a 100,000 square foot casino that promises to combine the best of Las Vegas and Monte Carlo. Jack Nicklaus himself is directing construction of a brand new 18-hole Nicklaus Signature golf course. The resort will include 40+ luxury retail stores, 30+ restaurants, bars and nightclubs all set on one of the world’s most spectacular beaches. Baha Mar is selling 284 private residences total for everyone’s taste. There will be one bedroom condominiums to three bedroom penthouses, and four bedroom total beach villas all overlooking miles and miles of sparkling clear, aqua blue ocean. Perhaps the best news yet: the lift will be so convenient, you will practically land at the resort. Seriously, Baha Mar has already invested in building more than $250 million new tree-lined boulevards that will connect the resort to Nassau’s sparkling new Lynden Pindling International Airport with only a 10 minute ride. Lynden Pindling is the largest airport in The Bahamas, and was recently enlarged even more. If you fly private, you can depart the mainland and be on the beach by ten. Fly commercial, you can early-bird it from DFW via Miami in the morning, and be on the beach by afternoon. One of the most interesting facts about this ambitious development is how it is leading the Bahamas out of the worst recession since The Great Depression. In April 2005, Lyford Cay-based property developer Sarkis Izmirlian put together the newly-formed Baha Mar Development Company and purchased three aging dowager hotels on Nassau’s Cable Beach. Baha Mar Development worked closely with the Bahamian government and put together plans for a multi-billion play world on Cable Beach that would include private residences, hotels, a casino, retail village, convention centre, state of the art expanded and enlarged golf course, plus of course beach and pool amenities. But, then, the perfect storm: The U.S. housing market came crashing down, with Europe to follow, like a twin domino. March, 2009. I remember the mood well, even in “we escaped-the-recession” Texas. (Yes, the tee shirts exist.) Real estate was glum, depressing, and no one was moving unless they absolutely had to or were carried out of their homes feet first. Banks were as dry as the the Sahara. Baha Mar, rather than folding the tent, looked east for it’s fortune, to the cash-rich Chinese government. China’s Export-Import Bank agreed to arrange $2.5 billion in construction financing and the China State Construction & Engineering Company (the largest construction company in the world) signed on to build the project. The plan called for Baha Mar to feature four luxury hotels and add 2,200 hotel rooms and condos to the country’s current inventory. By supporting Baha Mar’s development, the Bahamian government created 4,000 more Bahamian jobs, $400 million in Bahamian construction contracts, and $8 million for training Bahamian workers. After all, white glove hotels were coming in and the staffs needed detailed training to kick service up a notch or so..
Bahamian firms got their contracts, and the China State Construction & Engineering Company got to work. The developer also covered the cost of a fancy new electrical substation, built a central sewerage system, and even a reverse osmosis plant for potable water. Massive on-site generators guaranteed to keep the resort juiced up even after a storm for several weeks. Then the developer did even more economic hand-stands: when work on the $75 million road to the airport, named “JFK” by Bahamians, was stalled and slowed, Chinese workers pitched in and helped to finish it. Despite the Cuban Missile Crisis and the Cold War of yesteryear, this part of the Caribbean likes Americans enough to name a major street after an American president. Why do you want this second home resort development on your radar? If you are considering a second home for purchase in a beautiful beach environment, this is it, baby. 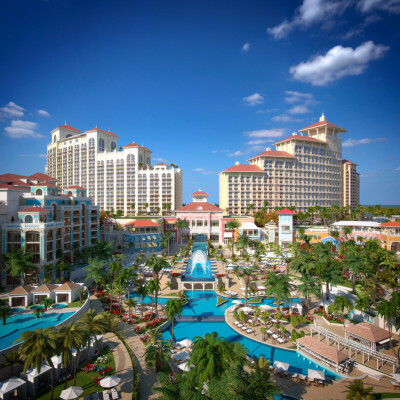 Buy now or keep Baha Mar on your radar. 284 residences are available for sale, starting at about $1.2 million, each with a killer water view. Baha Mar has the magic of great climate, sunshine and surf which means if you buy here, you will enjoy the water every day and every day will be like, well, vacation! 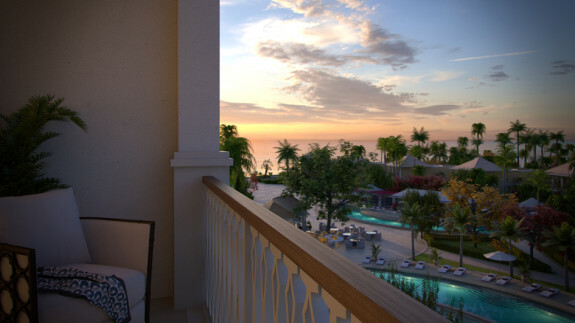 “The views are endless,” says Tom Dunlap, president of Baha Mar Development. Dunlap cut his teeth at Walt Disney Co. as vice president of Imagineering, then built a few billion dollar plus resorts in California and Costa Rica. Now he’s the man in charge of constructing every molecule of the resort from 9,000 sheets of drawings! It is in the design of Baha Mar where you most see the fingerprints of world-class developer Sarkis Izmirlian. Izmirlian’s charge to the teams of architects and designers was to create a place that provided all of the luxuries anyone could imagine in a five-star resort, but preserve the authentic look and feel of the Bahamas. Like the waterfalls and brightly colored stucco buildings that pop out and make you feel brighter just from the ocular jolt. Bahaman art will be proudly displayed and promoted. When you see the design of Baha Mar, the entire development looks and feels like the Bahamas. When you get a look at the uncompromising luxury of the finishes in the residences, your reaction is that someone really was very careful, thoughtful, almost obsessive about how they planned Baha Mar, as if they were matching the perfect weather. 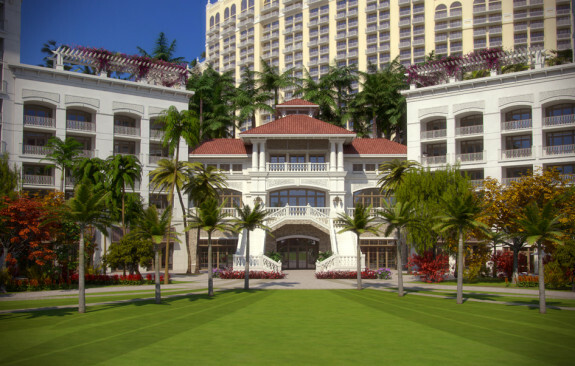 Baha Mar is becoming the poster child of a development that is doing everything RIGHT: the sophistication and solidarity of the developer, the construction genius of Tom Dunlap, a $3.6 billion USD infusion from China, and top brand names of the major hospitality players committed: Grand Hyatt, Rosewood and Mondrian. Dunlap says Bahamas buyers tend be 80% American, and 10% each Canadians and Europeans. Baha Mar, just this month, began marketing in the United States so you will likely begin seeing and hearing much more about the resort. 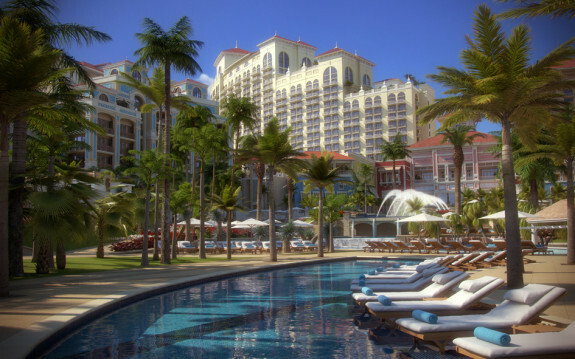 Baha Mar is also attracting an international jet-setting crowd with purchasers from Europe, Asia and the Middle East. Because of the generally low cost of living in the Bahamas and the virtual absence of property or income taxes, the Bahamas has become one of the world’s top retirement meccas as well as a jet-setter playground. While some second home purchasers are interested in a resort like Baha Mar because of the rental income a popular resort property can provide, most are looking for a place to create family memories in one of the world’s most beautiful water and natural marine life havens. They want expansive beach front, plus clean, sparkling warm waters, perfect weather and activities 24/7 the moment they arrive. That could be swim, snorkel, scuba, sun and jet ski, or it could be boat rides to explore private islands, lolling on a yacht, golf on signature courses, tennis, fitness, spa, arts and theater. And always, of course, shopping for the glamorous nights at the casino. Home run? After my recent visit to the Baha Mar construction site and teases of the housing to come, I’d say it’s out of the ballpark!